Is Amazon Prime Really Worth It? Do you have Amazon Prime? Think it’s really worth it? I have been skeptical for quite some time, which is also why I feel REALLY late to the game here, but better late then never! Actually, the reason I decided to sign up for the FREE 30 day trial was to get free shipping on parts for our wood fireplace. Living in a small town has its perks, but shopping isn’t one of them. Yes, I do love the super cute and unique stores, but the price points aren’t always in my budget. I do my best to shop local and shop small, but one also has to not break the bank. Plus, if I can get a deal on some things then it means I can splurge on other things! It’s all about balance right?! If you’re curious, I was able to save over $50 buying our fireplace parts on Amazon!! All I did was enter the part numbers from the manual, so easy! You could see how I could NOT say no to the Amazon Prime free trial for these savings alone! I'm not here to say "get Amazon Prime, you need to have it!" That's not the case, but if you're on the fence, I'm here to provide you with things I have learnt from my experience and experiences that friends have shared with me (I have a few pretty dedicated Amazon shopping friends!) and hopefully it will help you decide if it's worth it for you. The reason I was so skeptical to start with is because I didn't want shopping on Amazon to be too easy for me. I'm not a crazy shopper, but I have been known to impulse buy some things that really have been a waste of money. I also didn't want to be shopping just for the free shipping or just because it's a good deal. Let's be honest, is it really a good deal if you really don't even need that product? Maybe it's a good deal to someone who needs it, but it doesn't mean its a good deal to everyone. Enough rambling, let's get started! What better way to start then with the free trial! Yes, it really is free for 30 days, so why not try it out! Sign up when you have a larger purchase to make (that’s what I did) or when you have lots of shopping or gifts to buy. If you don’t think it’s worth it then just cancel after your free trial is up! Easy as that. Who doesn’t love free things anyways?! Just because it’s on Amazon, it does not mean it’s a good price. Yes, there are good prices on there, but there are also crazy prices! I do highly recommend knowing your prices before shopping so you can make sure you really are getting the best deal. For example, I was going to take advantage of Chapter’s Boxing Day Sale with their “great” prices, but for both the books I wanted, I found them for less money on Amazon. One book was about $2 less and the other was about $7 less on Amazon. That’s worth the savings for me. Yes, I am frugal. But like I said above, I have found some ridiculous prices on Amazon, so do your research. These are the two books I purchased using my free 30 day Amazon Prime Trial & I’ve also included my favourite face cream brand that is close to $10 cheaper then what I’ve been paying locally! Okay, here’s one more! I purchased this hot chocolate the other day using my Amazon Prime. In winter, hot chocolate is a go to following outdoor activities! I thought it seemed like a good price, but I wasn’t 100% sure so when I was grocery shopping yesterday I double checked and the EXACT same hot chocolate package was over $6 locally. Thats $3 in savings for ONE item! You’ll notice is shows $4.87 for the hot chocolate below, however I purchased it as an “add on” item and only paid $3.94. Add on items combine shipping and reduce costs for orders $25 or more. I’ll link to a few other snacky-treats ! Did you know Amazon has TV and Movies just like Netflix? Maybe I’m the only one who didn’t know this! I don’t watch a ton of TV, but we have watched a couple family movies and it’s an awesome bonus. 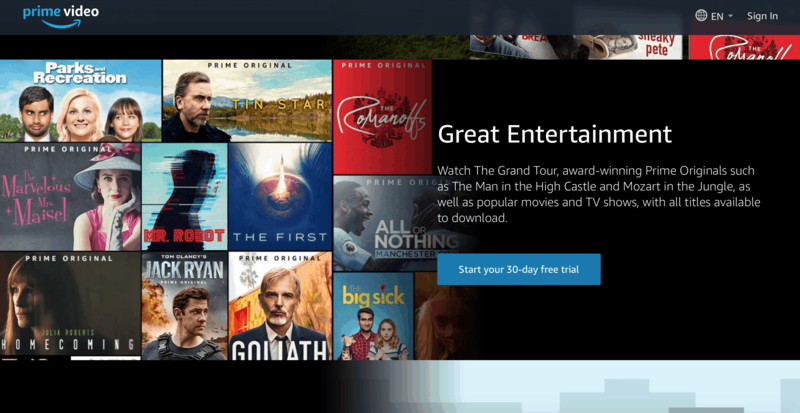 It comes FREE with Amazon Prime and you can get the Prime Video app on your phone or TV. Tell me in the comments what your favourite shows/movies on Prime Video are so we can all check them out! I don’t know about you, but I love shopping by category. It makes me feel like I’m browsing a store, which I love to do! I’ve included a few of my favourite categories below. Valentine’s Day and Mother’s Day are also great ones if you’re shopping for those hard to buy for people. This kind of shopping is already great for moms who don’t have a lot of kid free time to browse stores, don’t have access to a lot of stores or are just busy being a mom! Now you can shop from the comfort of your own home. Here’s another thing I only JUST discovered! With Amazon Prime you can get a FREE 90 Day Trial with Audible, where you can find audio books. I love listening to podcasts (because they are free) so I thought I’d give audiobooks a try! I’ve started listening to Eat Cake, Be Brave and it’s just a nice change of pace for when your eyes are too tired to read or, for me, while sewing. Do you have any favourite audio books? It took me a little bit to figure it out, but you need to get the app “Audible” to listen to the audio books, however you don’t purchase the books on Audible, you need to do this through your Amazon account. Again, you can get a FREE Trial. With Amazon Prime it is a free 90 Day Trial and you get your first book free. To be honest, I don’t anticipate on renewing this subscription, so if you know another free/reasonably priced resource for listening to audiobooks, let me know! 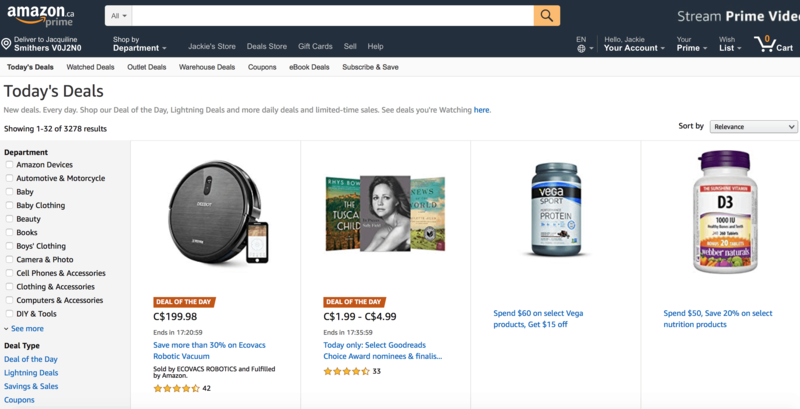 Yes, Amazon has coupons too! Just click on “Deals Store” on the top menu and you’ll find all the deals, including coupons! I haven’t actually tried the coupons yet, but it looks like you just click on it. Let me know if you’ve tried it. There are so many deals, you really just have to look around to see if there is anything that would be a good deal or you! E-Bates – Get CASH Back! 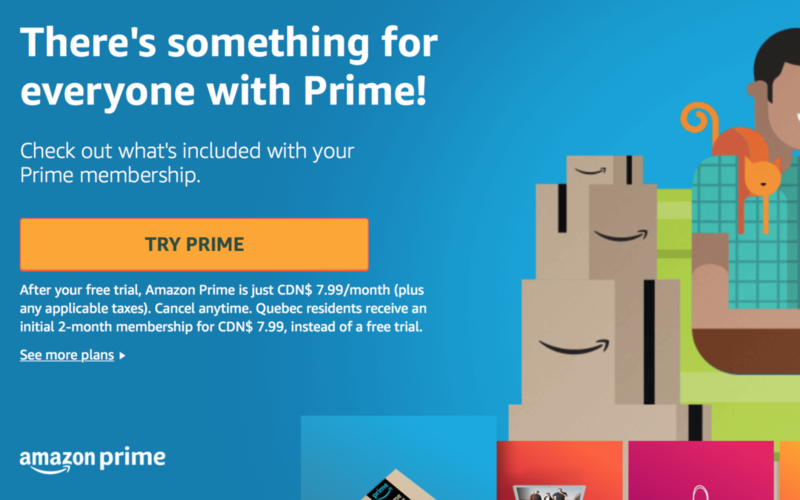 Are you already an Amazon Prime member? Have you signed up with E-bates, because if you haven’t you really need to now! You can get cash back when you shop. Yes, that’s right! It is a great website that actually pays you Cash Back every time you shop online and it’s free to join! Click the icon below. It’s not just for shopping online at Amazon either, there are tons of other stores including Indigo.ca, Amazon.ca, eBay, Sears, Old Navy, Forever21 and Groupon. There really is a ton more! I mean, of course there is, it’s Amazon! There is music, photo storage, subscribe and save. Oh, this is a great one for items that you use all the time like toilet paper, diapers, wipes, etc. If you get a monthly subscription then you save even more, sometimes 10-15%! Diapers or larger items like toilet paper can be a pain with a baby, especially because it takes up ALL THE ROOM in the cart! I haven’t personally tried these services, so I can’t say how awesome (or not) they are. I’ll let you be the judge of that! There is also Amazon Prime Wardrobe where you get clothing items sent, you try on and keep what you love, return what you don’t! You only get charged for what you keep! Don’t forget, when you are shopping and you aren’t sure about a product, just check the reviews or use the “ask a question” option! 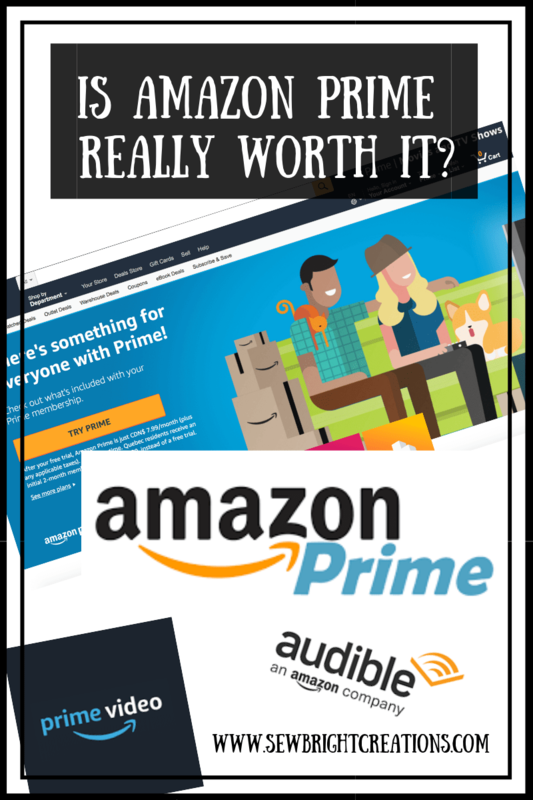 My Final Thoughts – is Amazon Prime worth it? I like to save money and get a good deal, but not to the extent of spending more money to get there. For me, I think Amazon Prime is worth it, if I shop wisely. I won’t be that person who is scrolling the daily deals because I will likely end up spending more money, BUT there are certain items that I can save significantly using Amazon Prime, not to mention it is super convenient when you don’t have easy access to stores. For this reason, I plan to keep it, however, as I mentioned above, I don’t plan to continue my Audible subscription, but hey, I’m sure going to enjoy my free book! My favourite part is being able to buy just one item and still get free shipping! This makes the savings even better because then you aren’t adding extra items to your cart, to qualify for free shipping (without Amazon Prime). I definitely do recommend trying the Free Trials because you really can cancel anytime!! If you do try it, make sure to click the links in this post so we can keep this blog going! Your support is much appreciated! Here are a few more finds you might be interested in! I cannot wait to receive the Nature Journal! Batteries are a great Amazon buy because they can be hard to find and expensive. Amazon makes it easier and cheaper! TThis post is NOT sponsored, but does contain affiliate links. If you click a link, Sew Bright Creations may make a small commission which helps to keep this blog going. Your support is greatly appreciated. The opinions and photos are of Sew Bright Creations’. Want to collaborate? Email Jackie at sewbrightcreations@gmail.com. Library has free audio books… just download and listen on phone or computer… they have the latest books. Awesome, thanks! I will check it out! I’ve had audible in the past and ended up unsubscribing because of how many credits I had accumulated. Through the PG Library I now use the apps Hoopla and Overdrive for audible books and ebooks for free. Thanks for this, definitely going to check it out. I’d love to get listing to more. Yeah, when I was scrolling around reading about Audible it didn’t look like something I wanted to stay subscribed to.